2012-05-13 ~ National Association of Postal Employees, Tirunelveli Division. 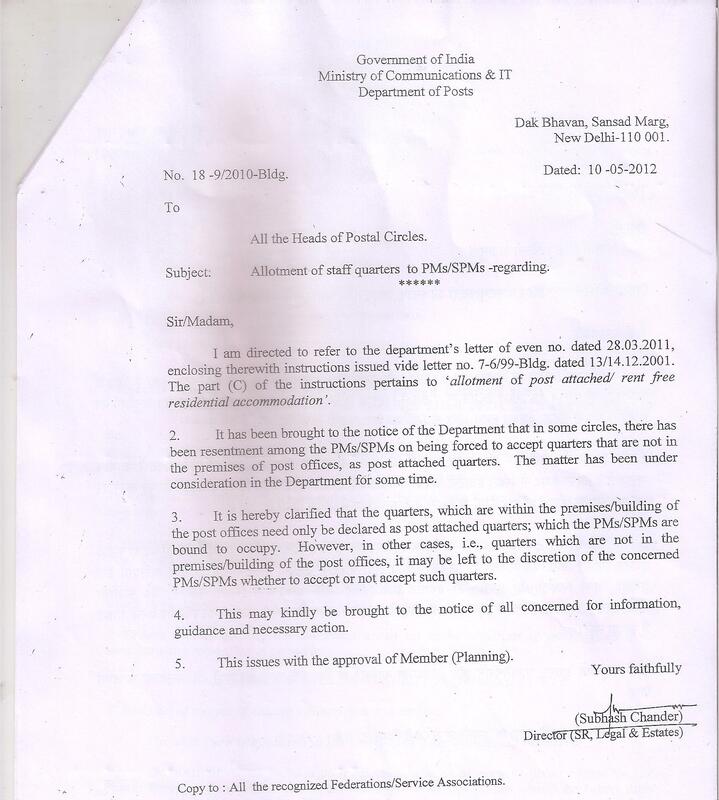 Orders have been issued by D.G Posts clarifying that the quarters which are within the premises/buildings of the post offices need only be declared as post attached quarters which the PM/SPMs are bound to occupy. In other cases the quarters which are not in the premises/buildings of all the post offices, it may be left to the discretion of the concerned PMs/SPMs whether to accept or not accept such quarters. 11 th meeting of the POSTAL SERVICES STAFF WELFARE BOARD was held in DAK BHAWAN on 16th May under the chairmenship of our HON MOS. Our Federation was represented by Secretary General FNPO. During the welcome speech our federation raised the issue of protection of TRCA to GDS . Hon Mos assured favorable orders will be issued within 15 days .In the Welfare Board Meeting some positive decision were taken in favour of GDS . Undue delay in settlement of agreed items of the strike charter of demands discussed in the meetings dated 10.01.2012 and 12.01.2012 taken by Secretary(P) with Postal Joint Council of Action. No weightage of marks secured by the candidates in 10+2 class will be given while preparing merit list. A common merit list for the whole circle will be prepared . Candidates can indicate their perference for more than one division. Thereafter candidates will be allocated divisions as [er the preference based on their position in the merit list. DECISION FOR NON -COUNTING OF RTP SERVICE FOR THE MACP PROMOTION. FEDERATION IS COLLECTING VARIOUS JUDGEMENTS. THE EX RTP OFFICIALS ARE REQUESTED TO SEND JUDGEMENT/ DOCUMENT IF ANY AVAILABLE WITH THEM TO FEDERATION BEFORE END OF THIS MONTH, THE CASE MAY BE FILED IN THE 1ST WEEK OF JUNE 2012.